At INFINITI of Northern Kentucky, we are committed to infusing true reward into every aspect of ownership. We honor this commitment with personalized service that recognizes, understands and anticipates your individual needs. And we stand behind it with a comprehensive program of premium services and coverage to help ensure your satisfaction. In the unlikely event that your INFINITI experiences a breakdown more than 100 miles from home, an INFINITI representative can authorize Trip Interruption Benefits covering such costs as transportation, lodging, and meals for you and your companions. Trip Interruption is available during the first 4 years after initial new vehicle delivery. For the first 4 years after initial new vehicle delivery, if you get a flat tire, run out of gas or need other assistance, we offer Roadside Assistance 24 hours a day, 365 days a year. To make your service experience as convenient as possible, INFINITI of Northern Kentucky is dedicated to providing you a complimentary Service Loan Car whenever your INFINITI is in for warranty repair. Restrictions apply. The INFINITI Elite Extended Protection Plan can be purchased for additional protection for covered components for up to 7 years or 100,000 miles and extends your 4-year Roadside Assistance. 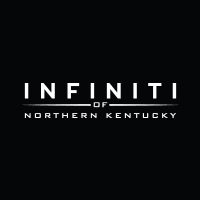 INFINITI of Northern Kentucky	39.0557801, -84.5449661.